Wheaten Terrier Dog Owner Sean Smith gets A Very Big Thank You for this interview about his "Wheaten", called Guinness. Can you tell me a little bit about your Wheaten Terrier dog? We got Guinness in a pet store in Bedford, Ohio during the winter in 2001 when he was about 6 months old and had him until he died in 2013. We had him neutered when he was about a year old. 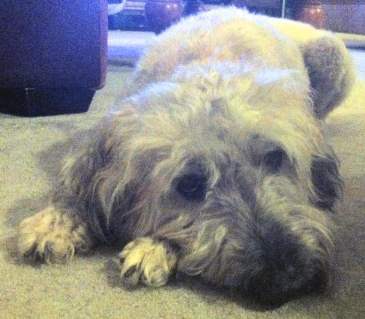 He was a medium sized wheaten terrier with a cream colored coat. My parents named him Guinness after the Irish beer because he had a dark brown coat as a puppy. As one of my first pets, he was a relatively relaxed dog and was very loyal. How easy was he to train? Guinness was an easy dog to train. The Wheaten Terrier dog is well known for it's exceptional intelligence, and Guinness was not left out. We never had to take Guinness to obedience classes, we just taught him all the basic commands ourselves. We did end up installing an invisible fence, however, as Guinness loved to explore. If you are looking for an easily trained breed, a wheaten terrier dog is a good choice. How much exercise does he need? Wheaten terriers are medium size dogs, so they need only a moderate amount of exercise. My family walked Guinness a couple times a week which kept him in good shape. If you do not have a lot of time on your hands to exercise a dog very frequently, a wheaten terrier would be a good choice. Most terriers are very energetic, but Guinness was content with sleeping under a table in our living room. Does he have a particular doggy smell? All wheaten terriers have a short, soft coat. They do not shed, however, so things would often get stuck in Guinness’s fur. You need to brush a wheaten terrier if you want it to have a beautiful, healthy coat. Guinness needed baths a couple times a month, or else he would begin to smell, as he had a knack for rolling around in our yard. 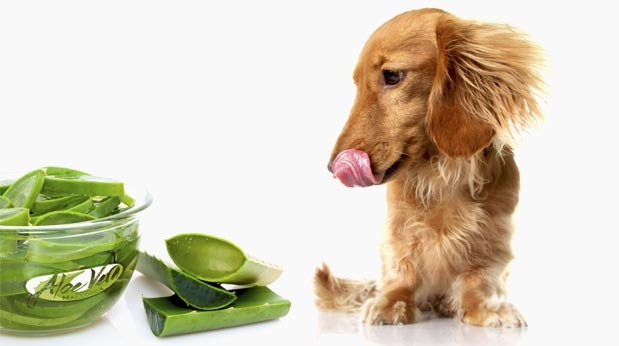 Even with the proper grooming you will still have the smell of the dog’s natural oil in its hair. Guinness did not have an awful smell so long as we kept up with keeping him clean. If you want to get a wheaten terrier you need to be able to commit the time required to clean and otherwise maintain its hygiene. The Wheaten terrier dog breed does not shed very much, if at all. They have hair very much like human hair. While this makes them great if you want a dog but have allergies, it also means you need to take extra care of a wheaten terrier’s coat. Their coats will collect things around them and will become matted if they are not brushed and bathed regularly. The extra effort maintaining the dog’s coat is well worth not having to clean up its shed hair. The dog being hypoallergenic is great for having guests as well. Wheaten terriers are known to bark fairly often, but with Guinness this was not the case. For the twelve years, we had him I had not known Guinness to bark hardly at all until we got another dog. 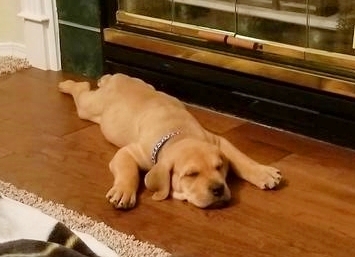 This may have been because our new dog made him more energetic. I’m not quite sure. When he did bark is was often just at passerby. Most wheaten terriers are very active, however, and like to bark. If you don’t want a loud dog, I would not recommend a wheaten terrier, unless you are willing to condition them to not bark. What is he like with other dogs? Guinness was energetic around other dogs. He was not very aggressive, but he was social and playful. He was a bit more aggressive with male dogs, but otherwise he was pretty relaxed. Wheaten terriers are very energetic dogs, and can sometimes be aggressive. For the most part. However, wheaten terriers are good with other dogs. Guinness would bark at dogs that people walked past our house, but that’s the most he ever did. If you are considering getting a wheaten terrier dog, you must take into account how much energy they are and teach them to use it in a playful manner. Do you have any other kinds of pets besides dogs? My family has had 3 cats, 2 of which died and one that we still have. We had all of them while we had Guinness and he treated them very well. He hardly ever bothered our cats. If anything he would get occasionally curious and approach them, only to be hissed at. We also had some smaller pets, but for the most part Guinness did not really care for our other pets. How is he around children? Guinness was excellent around other children. He would get excited when guests came into the house and run to greet them. On occasion, he would jump on them, but mostly when he was younger. Wheaten terriers are for the most part good around children. They can get aggressive sometimes because they are so energetic, but we never had a problem with Guinness. Would you consider him a fussy eater? Guinness was excellent about eating food. We never had a problem with him chewing on things except when he was younger and still growing. He would wait at our dinner table when we ate, hoping for something to fall off our plates. We would also give Guinness treats once or twice a day. We would change the food Guinness is eating once or twice a month, but he never did not eat what we gave him. I would not consider him a fussy eater. How long does it take to groom him? The Wheaten terrier dog breed are medium sized dogs but do need a fair amount of grooming. Given their coats and how they do not shed, it is important to wash them and brush them often. We would brush Guinness a couple times a week and bathe him twice a month. It is important to groom wheaten terriers frequently, or else they will begin to smell and their hair will mat. It took about 15 minutes to brush him and 30 to bathe him. Wheaten terriers are not very difficult to groom, but they must frequently be groomed. Guinness’s special characteristic was how calm he was. Most wheaten terrier dog are energetic and want attention, but Guinness was content to just laying next to wherever someone was sitting or laying. He was not demanding of being a pet or receiving treats. Guinness’s relaxed lifestyle was a beautiful break from the speed of the day.